Dr. Peter Ridd vs. James Cook University – Day 2 in Court | Watts Up With That? It is difficult when year-after-year a few of us explain that there is no substance to the many and varied – really endless – claims of imminent demise of The Great Barrier, and we are not believed. It is not that we lack evidence, but mostly our facts are considered too tedious … and our explanations are somehow bothersome because they don’t accord with the overwhelming consensus. Having never wavered, and it is now going-on twenty-years, I was so pleased today to know that the Federal Circuit Court in Brisbane is taking an interest in the detail: that Judge Salvatore Vasta wants to know about the quality assurance of The Great Barrier Reef research. So far it appears there is no quality assurance. Zip. Zilch. None. You might as well just make-it-all up, which is what many Australian scientists have being doing for years. As long as their executive summaries/abstracts are in accordance with the zeitgeist that says there is a terrible human-impact for which we must all be sorry, the scientists kept being funded – by the Australian tax payer. Today, Judge Vasta asked how it could be that James Cook University – a recipient of so many billions of dollars over the years – could leave no stone unturned in its disciplinary process against Peter Ridd, while doing absolutely nothing to address his complaints about the lack of quality assurance of its research. Not once in court today, or yesterday, was there any defense by the James Cook University Team of “the science” that Peter Ridd has been so critical of. The university is simply arguing that he doesn’t have a right to speak-out. At one stage, it appeared that James Cook University were going to argue that Peter Ridd was unqualified to have an opinion on biological matters because he is a physicist, but so far, and after two days, James Cook University are not running that argument either. They are simply claiming that the university’s code of conduct prevents its employees from being un-collegial, and specifically Peter Ridd from being so critical of his colleagues and their research. The arguments will continue in court tomorrow/Thursday, 28thMarch at the Harry Gibbs Commonwealth Law Courts Building, 119 North Quay, Brisbane CBD from 10am. March 27, 2019 in Climate News. It appears the Judge is looking at the finer print of the controversy, a bad sign for the University. Yes, funny how when the actual law is applied, the SJWs don’t get away with as much. They are so used to kangaroo courts and using public shaming to get what they want, they absolutely lose it when the grown ups run things. Censorship is very powerful in Universities across the world. They are asking about QUALITY CONTROL, – well, in Academia, QA is PUBLISHING !!! When you publish a paper, it is to get response from all the other researchers within your field. This is very simple – this is the real quality control. Martin, I disagree with your statement that in academia, publishing is quality control. Instead, each measurement takes as a part of a scientific endeavor, inside academia, government laboratories or in industry must be subjected to a rigorous quality control and quality assurance program. Otherwise, it is just an opinion. Thermometers and pH instruments should be calibrated before and after use to validate the measurements. etc. etc. I do agree that the peer review process should be a FINAL QC step, but unfortunately, the publication and review by readers often reviews flaws, also. so all Ridd did was provide quality control. a sackable offence at JCU. Yep, Martin, thanks for that, and if you do provide some real and justified criticism, it appears the reward is to get sacked. Dunno about you, but I reckon that sort of QA and QC is not going to work. tolerated MainStreamResearchers within your field. This is very simple – this is the easy way out. So very true and yet everything called ‘science’ that supports CAGW alarmism defies the laws of physics. Also Geology one would think (in places where permitted of course). Literally denies Newton’s Law of Gravity which applies to molecules as well as satellites . The alarmists, on the one hand, celebrate the tree related work of Dr. Mann, a physicist with no formal arboreal training. They cannot, on the other hand, denigrate the work of Dr. Ridd on the basis that he is only a physicist. It is basic to the scientific method that only the facts are considered. Everything else is irrelevant. Alfred Wegener, the father of continental drift/plate tectonics, was a meteorologist by degree. Ultimately, his ideas won out due to the mountain of real evidence that accumulated in four decades. “Bretz conducted research and published many papers during the 1920s describing the Channeled Scablands. His theories of how they were formed required short but immense floods – 500 cubic miles (2,100 km3) – for which Bretz had no explanation. Bretz’s theories met with vehement opposition from geologists of the day, who tried to explain the features with uniformitarian theories. “J.T. Pardee first suggested in 1925 to Bretz that the draining of a glacial lake could account for flows of the magnitude needed. Pardee continued his research over the next 30 years, collecting and analyzing evidence that eventually identified Lake Missoula as the source of the Missoula Floods and creator of the Channeled Scablands. In geology, “uniformitarian theories” were the equivalent of “the climate consensus” of today. So there’s two major theories in Earth science that won out over “the consensus” because, in the end, those scientists on the “wrong” side had the integrity to follow the evidence wherever it led, even if it eroded their favorite uniformitarian beliefs. No scientific discovery or advancement has ever been made by a bunch of supposedly “learned” individuals nodding their snotty heads in unison. They are good examples. I don’t know enough about them to know for sure, but I suspect that the consensus scientists then did not have scientific fraud in their armamentarium which, unfortunately, is a big part of current climate “science”. Wegener is surely a fantastic example of someone looking at facts and ignoring consensus. That is pretty much how it all started. We had scientists before we had scientific institutions and most were amateurs under any modern definition, usually independently wealthy individuals who had the time and the money for equipment, in addition to the necessary mental frame. When I was in 5th grade (circa 1949) our teacher explained the continental drift theory. Didn’t leave much doubt in my mind that it was true–the jigsaw puzzle pieces fit too well. More recently, my sister drew many maps of Gondwanaland for geological publications as the theory got taken seriously by another generation. Just to add that the Megaflood thing is truly awesome. Nova did a documentary on the subject that is well worth watching. If Peter Ridd isn’t a person capable of making a meaningful discussion on the subject then anything he says about the subject is just gossip and general chit chat and not collegial chatter you can sack him for. Just remember the range of climate scientists listed and lauded on the famous 97% papers… there were physicists, geologists, meteorologists, biologists, (experts on the lesser spotted bilbil etc), psychologists, economists …. it turns out that very few people bear the title “Climate Scientist’, they come from all disciplines. And a physicist who has spent 30 years studying the reef must more than qualify, right? It’s worrying that they University is focusing on being “un-collegial”. They had no hope of defending the science; neither practice nor conclusions. But a case of breaching the in-house rules of the University touches on a far more nebulous boundary. It is pretty “un-collegial” to demand that fellow scientists bury, hide, obscure or contradict evidence. It was reported on these hallowed pages that corals in quantity can alter the pH of the ocean in which they live. The reason they can do this is because the waters around them are often very shallow – there isn’t that much water. The mechanism is the removal of CO2 from the water which raises the pH. The limitation on growth of a coral when the temperature increases (which it does daily) is the availability of CO2. See the relevant article also discussed here at WUWT. When the temperature rises the coral grows faster and faster until it runs out of CO2 by which time the pH of the water around has risen. If this condition persists, the coral’s response is to kick out the symbiot and wait for a more capacious variety to drift by and take up residence. The coral always selects for optimum growth under the prevailing conditions. I suppose that is why they have survived for hundreds of millions of years and live all over the world. Wouldn’t it be ‘un-collegial’ for the university to destroy its reputation and standing by permitting ONLY one side of any issue or argument. It seems the risk of this happening is very substantial. So coral bleaching is due more to the availability of CO2 (or lack thereof) than it is to temperature (although the two go hand in hand)? Lots of things impact coral, including disease outbreaks, starfish infestations, storm damage, damage from boats dragging anchors, and perhaps even sunscreen from bathers. Disentangling the effects of all those factors is challenging, and speculation that manmade global warming causes damage is weakly supported by evidence. Here’s a map showing the worldwide distribution of coral reefs. What do you notice about their distribution? Obviously, they are clustered around the equator. In fact, the warmest water basins have the most coral reefs. Even the very warm Red Sea is peppered with coral reefs. Water temperatures in the Red Sea vary from one end to the other. The north (Mediterranean) end is cooler, on average by about 2°C in the winter, and by about 4°C in the summer. But reef-building corals thrive at both ends. Even the very warm southern end of the Red Sea has many healthy coral reefs — and the cooler Mediterranean Sea has hardly any. There are many thousands of species of corals, and different species occupy different ecological niches. Some inhabit temperate zones, and don’t do well in warmer water. But most prefer the tropics, and, where there are seasons, corals generally grow fastest in the summer. The great weight of evidence is that man-made global warming is modest and benign, and higher CO2 levels are beneficial, for both mankind and natural ecosystems. There’s something pathological about people who are so desperate to find a dark lining in every silver cloud, that they twist evidence and truth into pretzels, to support their dystopianism. In other words, its the old “a socialist sees something work in practise but doesn’t believe it because it shouldn’t work in theory”. The university is playing it has expected , sticking to ‘policy ‘ and making no mention of the science . Has that is there best had , then it is the right thing to do if gives them the best chance of a win. While once again people are in danger of failing to understand they can ‘win ‘ on the scientific battle but lose the war because the fight was never over the science in the first place. This will not come down to the correctness of the science , it will come down to if the universities policy on this, is acceptable grounds to take the action they did , and that is sadly a question Peter may not like the answer to. For it possible for the judge to say ‘its poor policy but correctly applied ‘ the fact Pete was right in his statements, may not matter on bit. The university’s policy may be overbroad and may contravene Australian law or regulations. Here’s a link to American web page. Toward the bottom of the page is a comment about a recent NLRB decision re. William Beaumont Hospital. In light of that, it seems possible that the judge could strike down the university’s policy on several grounds. There is a point of contention about whether the employment contract’s academic freedom clause applies in this case. The university seems to be stretching the point past its elastic limit. My guess is that the decision will boil down to the manner in which Dr. Ridd criticized the work of his colleagues. I wonder if whistle blower protections might apply. It is under Australian law nothing in US law means anything it has it’s own act of parliament. As for whistleblowing the University of Queensland like most universities comes under Public Interest Disclosure Act 2010. If you aren’t happy with that you hand the matter to the Ombudsman or the Crime and Corruption unit. So that is not stuff that will come up in a fairwork hearing it is a matter for other courts. That’s true as far as it goes. The NLRB decision involves the interpretation of the law by a quasi-judicial body. Given that Australia and America are common law jurisdictions, it is useful to look for similar laws, regulations, and precedents. If you find an American decision, my bet is that you will usually find an Australian decision on the same kind of case. Even if the decisions are different, the logic is likely to be similar. In Dr. Ridd’s case, I would bet there is relevant Australian case law. My guess is that it was referred to in court but that it went over the reporters’ heads. The case is not under common law it is under the fair work act which is industrial and labour laws which you have no equivalent of. I fear you might be correct. I see Peter in the role of whistleblower. He has pointed to serious procedural inadequacies within the organisation where he works, presumably after personal contact with the people concerned failed to resolve the matter, and has paid a penalty. In a private or public company the result would probably have been the same; but this is a public institution sustained mainly by the “hard-earned” from the Australian people. They have the right to know when their taxes are being misspent in academia, or anywhere else. The long term effects of judgement in favour of JCU on further education in science in the western world would be to tighten the grip of the left wing tyrants and enable them to stifle all opposition. If that is the case, James Cook University may win this battle, but IMO it will be a pyrrhic victory which besmirches their reputation beyond salvage. One should wonder if they can retain accreditation give such un-academic behavior. This is already far more of an embarrassment to (JCU) than to Peter Ridd. But who is it they care about , the University concern is funding towing a line which produces funding is never going to do it harm . And they you have its academic status , you be right for most areas this would be a problem , but this is ‘climate science ‘ where the impact of your claims regarding headlines and support ‘the cause’ is the MOST important thing , and facts be dammed . So they would not even lose out there, as in reality be conforming to ‘normal practice ‘ in a area which regards ‘heretics’ as worse then ‘deniers ‘ which Peter is not . Question did they follow their own procedures correctly . Question , are those procedures ‘fit for purpose ‘ even if poor. A victory will raise the university’s reputation in certain quarters. What they have done IS academic behavior, according to today’s standards. You can’t besmirch garbage. I have some experience of having to evaluate science of a different discipline to my training and practice (10 years as professional molecular biologist) when working for early stage VC and technology transfer organisations. I would be the first to admit that there were some cases I owned up to needing external help to evaluate the technology (rather abstract organic chemistry moieties), but in several cases, it is perfectly possible to form opinions through reducing the critical concepts down to key questions. I was involved in things like self-assembly technologies, drug development projects, bioinformatics concepts, materials chemistry etc. 1) How do you go about measuring health and/or decline of the GBR? 2) How did such a measurement regimen emerge and become accepted as standard? 3) Does proxy data exist to indicate whether cycles of growth and decline are a natural feature of the GBR across millennia and geological time? 4) Do laboratory experimental model conditions exist anywhere on earth to allow controlled experiments to measure the effect of specific environmental challenges on the growth/decline of key components of the GBR? 5) Is research funding predicated upon there being a threat per se to the GBR? 6) How many active researchers, if any, working on studies related to the GBR have cast doubts on the scaremongering narrative in the past 19 years? Note that my opinion has not been sought. My strategy is to understand, to question, to clarify, then to speak to others to confirm, equivocate or refute the initial answers. One great advantage in not having skin in the game is not being beholden to external pressures. Academia tends to feel threatened by such freedom. Seeking out the truth in controversial arenas may be deleterious to your career health. There is no such thing as “climate science”. There is only science, in all the massive array of various disciplines and lines of thought and research. Think of the old Indian proverb of the blind men tasked with describing an elephant. That is the essence of what real scientists are facing when trying to understand a natural system as vastly complex, with untold interactions, from the astrophysical level to the microbiological, and geochemical, and geological, and ecological, and sociological, and economical levels, and thousands more levels yet to explore and understand, that altogether yield what we call the “climate”. Climate science as it’s currently practiced is definitely distinct from real science and operates under a different set of rules. As you inferred, real science attempts to understand the world around us by applying the scientific method. Those engaged in ‘climate science’ who accept the IPCC as the authority distort reality, make stuff up, ignore contraindications and hyperventilate in order to conform to the UNFCCC’s political narrative, therefore it’s inappropriate to even call ‘climate science per the IPCC’ science. The complexity of it all is wildly overrated and constantly cited to provide the wiggle room to make claims that are otherwise impossible seem plausible. Much of the perceived climate system complexity has to do with chaotically converging to a relatively simple and easily quantifiable steady state solution and has nothing to do with what that steady state solution must be. Looking at disciplines like biology, chemistry, mathematics, physics which have a circumscribed field, we can speak of experts within that field even though they may be focused on a particular part like organic chemistry. You are correct in recognizing that a “climate scientist” does not have a limited and circumscribed field but depends on the experts from various disciplines. So not only is the designation “climate science” problematic but also the claim to be a “climate science expert.” There is no such person. Very few people are experts in even two of the science disciplines. These “climate scientists” have to depend on Mathematics and Statistics, on Chemistry and Physics, on Geography and Geology, on Meteorology and Computer Science. That is why the opinion of a “climate scientist” can be refuted when someone from any of these disciplines sees holes and flaws in their presentations. Discrediting them because their work shows no obvious relation to climate is simply disingenuous. “Climate science” is a false science. There is no single scientific discipline that can possibly encompass all or even small subset of all the factors that result in what we call “climate”. The Indian proverb of the blind men attempting to describe an elephant is the perfect metaphor for what the so-called “climate scientists” practice. They take one data input, make vast assumptions, and from that draw obviously wrong conclusions, every time. The only possible science that can describe climate performance in terms of inputs and outputs is interdisciplinary science. The ones who call them “climate scientists” are mostly people who are engaged as computer modeling technicians making false assumptions, pumping garbage in and getting garbage back out … with no interaction with the vast array of other scientific specialists whose knowledge and perspective cannot be denied. In effect the university is arguing “go along to get along”. The problem is funding and the resulting corruption of science. Science becomes a quest for funding, not a quest for truth. To expose shoddy work is to risk funding, therefore criticism and dissenting views cannot be allowed. Imagine if this had happened evolving anything else other then the Lefts sacred cow, CAGW. Imagine it involving cancer research, or building construction. This is a straight up case of fraud and whistle blowing. And if you really need an example of what life looks like when pointing out fraud or corruption is considered a crime, look at East Germany in the 80’s. It ain’t pretty. 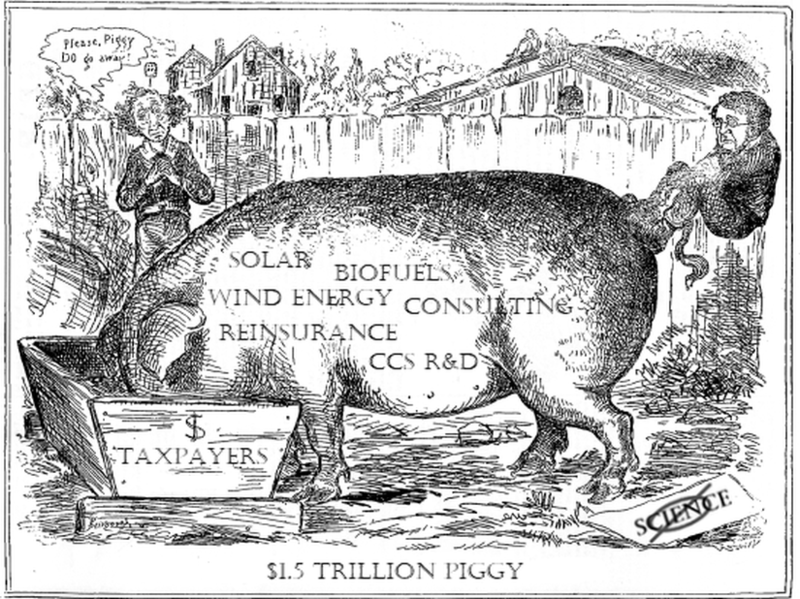 Schitzree, climate alarmism is far from the only sacred cow (pig?) for leftists, though it’s certainly the one with the most money at stake. There are many other fields which are just as corrupt. Have you seen this? Seems like a hopeful sign that the judge is asking questions about research quality. Is Dr Ridd wrong in his criticism. If not then he should receive the university’s backing for having the courage to speak out. Even if he is wrong (he’s not) he should be able to speak out freely. James Cook University defends junk science to the limit. Toss out the administrators. Let them get a regular job. It’s a very odd defense, since “collegial” means equal sharing of authority, or working in an environment of peers, where there is give and take. For all intents and purposes JCU is showing ignorance of the true meaning of it’s own code, and acting in a manner that is contrary to their own code. Sounds like the judge in this case is on to them. Here’s to hoping that JCU is publicly humiliated. In Libspeak, “collegial” means don’t rock the boat, don’t hurt anyone’s feelings. I realize that this is Australia, but under US law if this requirement came out of a law or regulation it would likely be struck down as unconstitutionally vague. Even under contract law, where there might be much more similarity between the US and Australia, clauses can be struck down as unenforceable if it is impossible for one party to determine, using the “reasonable man” rule, what their obligation is under the clause. If they won’t tell you precisely how speaking to a reporter about work done at taxpayers’ expense by other faculty of the university amounts to a breach, I’d say there’s a prima facie case for damages. Good point. Let’s hope the judge actually sees it from that perspective. Really appreciate the updates. Thank you. The fact that collegiality is their central argument and is being defined as avoiding becoming critical of each other’s work nails in place the coffin lid made for the express purpose of insuring science advances one funeral at a time. It isn’t just in climate science either. Do they even offer graduate courses in research critique anymore? Philosophy of Science is pretty rare in a Post Modern institution. I’ve run across a number of people who got their PhD post 1990 who really are unaware of the arguments needed to establish real theory. I suspect they are going to get themselves into a bind because if you aren’t allowed to openly collegial criticize anything then you need a collegial complaints procedure. I am waiting for the judge to ask them about there collegial complaints procedure and if they don’t have one they are in trouble. That’s a good point. Who filed the complaint? For libs, offense is in the eye of the beholder, so did someone actually file a complaint or was this a preemptive strike? Do I understand that the University’s approach is by defining “un-collegial” in a particular way? If that’s their best shot then it’s a mighty risky one IMHO. If the science which Ridd is questioning is so robust then a collegiate approach is surely “bring it on”. It should be easy to dismiss criticism without resorting to authority appeals or the shutting down of debate. Surely it is far more collegial to highlight poor science than it is to keep silent. It is how science progresses. Think my first reply disappeared into the either. I don’t know all the background, but the universities’ complaint is that Peter took the argument into the public forum. He went to the news papers about the science and that he didn’t agree with it. Thereby besmirching the university’s good name. Yes, he went public, but do we know what efforts he made before that? From afar, he seems to be an honest man well aware of procedure and I would bet that he tried every means available to him within the institution to attempt to correct the defective methodology. When you have hit every brick wall there is to hit, your only course of action is to climb over and go outside (or just roll over, but he is better than that). I have a red mark in my work record because a newly-graduated snowflake, who despite being “educated” for 20 years, thought my simple question: “Can you check this again, I’m not getting what you’re getting, you may have missed something?” was “bullying”. I only wish I was making that up. phony fake erroneous science will not tarnish our good name, but having you tell people that our science is phony fake erroneous bull will! Dr. Ridd’s complaints about the behavior of others is un-collegial. However, the viscous attacks against him by the administration is not. The actions of a majority are collegial. The inconvenient actions of a minority are wrong, criminal or treasonous. Physics is essentially a very detailed study of Applied Mathematics in all (most) disciplines. Search for a decent upper level Undergraduate course in College Physics or a Graduate course and look at the Chapters. Like “Modern College Physics” by Richards, Sears, Wehr and Zemansky. And how else do you really determine how old a geological deposit is? How old sediment is? When something happened? Look at the calendar??? Resnick & Halliday volumes 1 and 2 were our go-to texts. Adding up the categories, it seems that they received A$324,562,000 from government for their 2017 budget, and even more the previous year. So, yes, they have, indeed, received many billions of taxpayer dollars over the years. Dr. Jennifer, I’m sure I speak for more than myself in offering my thanks to you for a couple of things. First for both fighting and reporting on the fight of Dr. Ridd for the right to criticize, even criticize strongly, the ideas and claims of his scientific opponents. Not criticize the opponents. Criticize their ideas. And second, my thanks for a lifetime of honest, clear, transparent scientific work. I don’t see how anyone who calls themselves a scientist could argue against testability and reproducibility. You do have to wonder why when someone with a PhD. has had 30 years experience as a scientist studying the reef that a claim that he needs a 3 year biology degree to be taken seriously is taken seriously. I might be tempted to dismiss an opinion if it was someone with a PhD in biology evangelizing on the GHE but this is ridiculous. Re. the mention of Wegner, from the time of Sir Frances Drake who remarked on the known fact that the East coast of South America was a close fit to the coast of West Africa, the evidence slowly accumulated. The discovery of coal seams on one side continuing on the other side should have made people think that regardless of no evidence as to how such a separation had occurred, it obviously had. I think that consensus is just a word for lazy scientists who just sit back and enjoy their status in the Universities. Then someone like Peter Rid comes along and rocks the boat. Town down under named after a dude called Darwin. He studied at Christ College Cambridge to be a preacher. Credentials matter little if you comply with the party line. When the other side brings our the cartoonists, lawyers, PR spin doctors and ex-politicians, you know the “bench strength” of the team is pretty thin. Why is it that Peter Ridd cannot question the views of his colleagues but they can complain of his. Because he stepped away from the consensus. Very bad thing to do in Australian academia. As someone in Leah Rimini’s series about leaving Scientology says, the difference between a religion and cult is what happens when you leave. I was only being snarky before when I brought up the idea that True Green Believers were cultish. Now, its becoming a rather proveable fact. I wonder if the federal government will grow some kahunas and sue JCU for the return of the billions it swindled from the Australian taxpayers ? I notice that when the geographic distribution of corral reefs is discussed, graphics typically show the reefs clustered around the equator. I don,t have any references easily at hand but expect that this paradigm is/will change. For example, a marine protected area was recently declared between Nova Scotia and Newfoundland in an area called the Gully. It is very deep, cold and dark. Fisherman had noted for 3/4 of a decade the proliferation of groundfish in the area. They also noted that it was almost impossible to fish in the area because trawl became hopelessly entangled on the bottom. The fisherman would come home with long, up to several metres (if I recall correctly) tree trunks. They nick named the area the Forest. Only recently have scientists ‘discovered’ that the trees are actually corals. This is a major reason why the area (along with its other biodiversity) was designated as a marine protected area. Having said all that, I believe that the low hanging coral reefs, shallow and easy to see) have been found but that extensive deep sea corrals are everywhere waiting to be found. As an afterthought, I was told be fisherman that the multinational fishing companies set out to solve the fishing problem in this area. They fastened massive chains across the mouths of the dragger nets, than set out and dragged back and forth across the reef until they pounded it flat. Thus was solved the problem of catching fishing gear in the area of the Trees. I have visited an ancient, now dead coral reef and it is indeed distressing. To witness the devastation and corruption of this once thriving cradle of life is enough to break anyone’s spirit. I think they call it Florida now. That’s due to Sea Level decline , right ? But consider it CO2 sequestered for the ages .